Every once in a while, I come across an offer that brings together a couple of things I'm interested in, and as a result seems like it was targeted right at me. I came across one such offer recently, and I'm looking forward to attending a Hirsch Vineyards wine dinner at Upstairs on the Square in Harvard Square in Cambridge, MA on Thursday, March 26th at 6:30pm. When I think of Hirsch, I think of a premium Sonoma Pinot producer. And I'm a big fan of Sonoma Pinot, especially after spending a day visiting Sonoma Coast wineries and tasting rooms last fall. I visited Keller Estate, Adobe Road, and Clary Ranch and brought back wines from Zepaltas and Ridgeway. All that I've tried have been fantastic so I'm looking forward to becoming more familiar with Hirsch (which I've only tried at tastings so far). Interested in Sonoma Pinot Noir? You might be interested in this interview I did with Paul Clary from Clary Ranch -or- this interview I did with Ryan Zepaltas from Zepaltas Wines. And thanks to The Passionate Foodie for letting me know about this event! Not that you need yet another reason to take advantage of this offer, but judging from reports on Twitter, U2 ate at Upstairs on the Square after their March 12th, 2009 "secret" show in at the Somerville Theater. Question of the Day: What do you think of Hirsch? 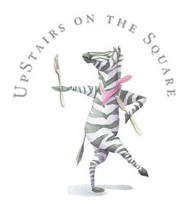 What do you think of Upstairs on the Square? Any chance you might be able to join us for this event?